Ogwumike rocked a pair of custom Nike Zoom LeBron Soldier 10 sneakers. Her right shoe featured her initials, “NO”, on the forefront strap and “MVP” on the ankle strap. Her left shoe displayed her jersey number, “30”, on the forefront strap and “2016” on the ankle strap. Playing a career-record season, Ogwumike was awarded as the 2016 WNBA MVP of the regular season. She was third in the league in both scoring (19.7 ppg) and rebounding (9.1 rpg.) She reached a career record of assists (3.1 apg) and blocks (1.1 bpg.) Also, she nearly surpassed the all-time WNBA record of FG% during the regular season at 66.5%, second to Tamika Raymond’s 66.8% back in 2003. Ogwumike is well on her way to add another milestone to her career, as the Sparks are one win away from winning the championship. We’ll have to see if James makes a public shout out again if she gets a ring. “I just want to thank the King (King James) for the shoes, thank the King for the support, and hopefully we’ll get to see him soon, celebrating in the same way that they (Cleveland Cavaliers) did this year too,” said Ogwumike to USA TODAY Sports. James isn’t the only one posting shot outs. 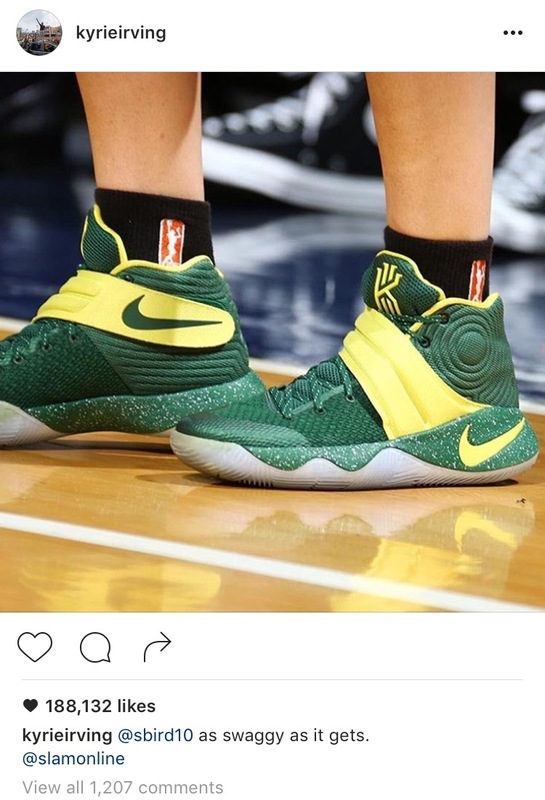 His teammate, Kyrie Irving, has been showing extra love to the WNBA on the ‘gram. 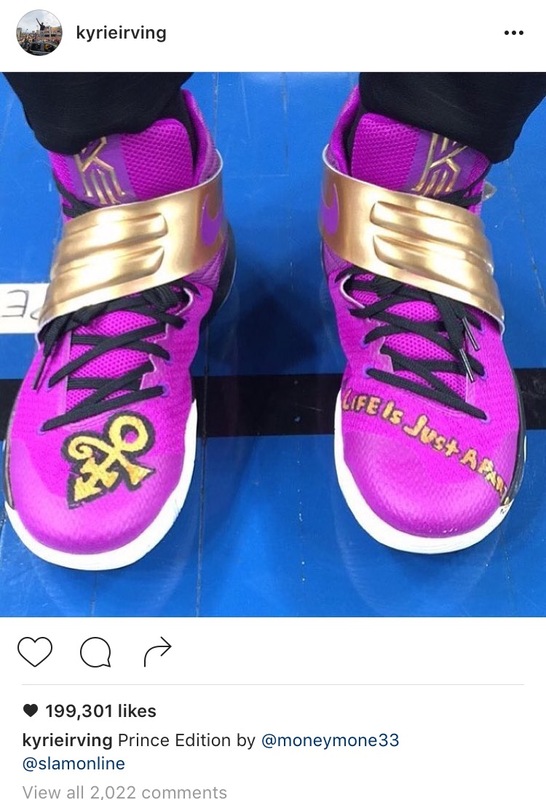 Sue Bird of the Seattle Storm rocked Nike Kyrie 2s and Seimone Augustus of the Minnesota Lynx wore a pair of the same kicks in a dope purple and gold colorway to honor the late musician, Prince. Irving also acknowledged Alana Beard’s buzzer beater shot for the Sparks in Game 1 of the Finals. For Irving, there’s no better feeling to witness athletes dominating in his signature kicks. Wait, let’s rewind real quick. This moment is most likely a close second to winning his first NBA Championship. 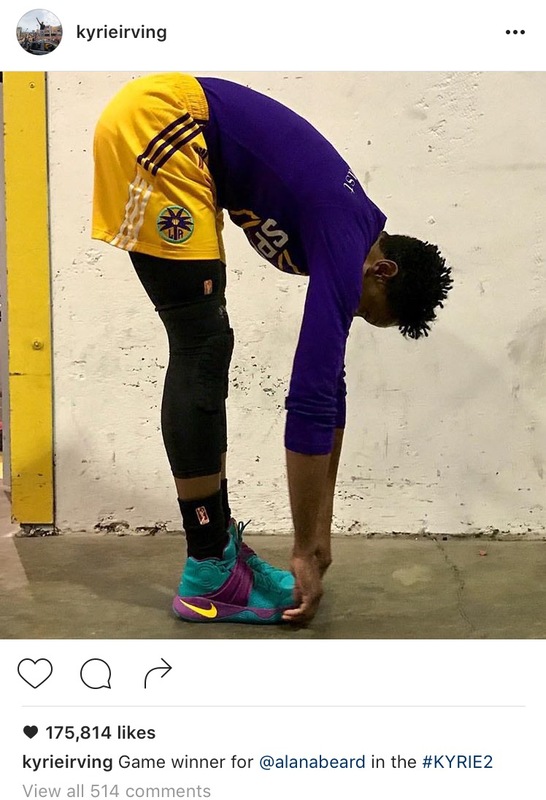 This is not the first time players in the NBA paid homage to their counterpart. In fact, several NBA players watch film of and are motivated by WNBA athletes. We hope to see more public acknowledgement of the WNBA, a league that certainly deserves more shine.